Price: $791.10 - See Lower Price in Cart! The 1000 Watt EF1000iS weighs in at 27.9 pounds, making it extremely portable. Among the quietest portable generators in its class, the EF1000iS features Smart Throttle which allows greater fuel efficiency and noise reduction. It will run up to 12 hours at ¼ rated load on a tank of gas. With features such as Pulse Width Modulation, Auto Warm-Up, and an Oil Watch Warning System, the EF1000iS is the most portable, efficient inverter you can buy! Lightweight, easy to carry design ‐ Compact lightweight alternator reduces weight to 27.9 lb., the lightest weight in its class. Smart Throttle, load sensing rpm control - Greater fuel efficiency and noise reduction by automatically adjusting engine speed to match the load. Auto Warm-up - Automatically increases engine speed for 4~6 minutes to ensure smooth power delivery during cold start ups. 12 Volt DC output, battery-charging cables included - Recharge 12-volt batteries for RV, auto, marine, etc. Exclusive dual coil alternator stator - Greater output at a lower engine speed for reduced noise, fuel consumption, and engine wear. Centralized control panel - Easy access to controls. Gasoline petcock lets you shut off the gas to run the carb dry for storage - Prevents stale gas problems. 50cc Overhead Valve (OHV) engine - Noise-reducing operation with improved efficiency, increased reliability, and low oil consumption. Large fuel fill access - Wide mouth fuel fill reduces spilling and overflows during refueling. EPA & CARB Emission Engine Durability Rating - Yamaha generators have the longest emission engine durability ratings issued by the Environmental Protection Agency and the California Air Resources Board. 50 state legal - Meets emission regulations, including CARB. Factory Warranty - Covers the entire generator for defects in parts and workmanship for three (3) years when the generator is used for non commercial, industrial or rental use. 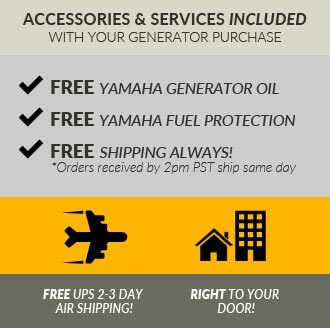 When the generator is used for commercial, industrial or rental use, Yamaha covers the generator for two (2) years. Inverter or Generator? What is the difference? How to choose the right size Generator. Yamaha Versus the Competition - WHY YAMAHA? Compact lightweight alternator reduces weight to 27.9 lb., the lightest weight in its class. Greater fuel efficiency and noise reduction by automatically adjusting engine speed to match the load. Automatically increases engine speed for 4~6 minutes to ensure smooth power delivery during cold start ups. Recharge 12-volt batteries for RV, auto, marine, etc. Greater output at a lower engine speed for reduced noise, fuel consumption, and engine wear. Noise-reducing operation with improved efficiency, increased reliability, and low oil consumption. Wide mouth fuel fill reduces spilling and overflows during refueling. Meets emmision regulations, including CARB. Covers the entire generator for defects in parts and workmanship for three (3) years when the generator is used for non commercial, industrial or rental use. When the genertor is used for commercial, industrial or rental use, Yamaha covers the generator for two (2) years. 17.7" x 9.4" x 14.9"
Awesome job! 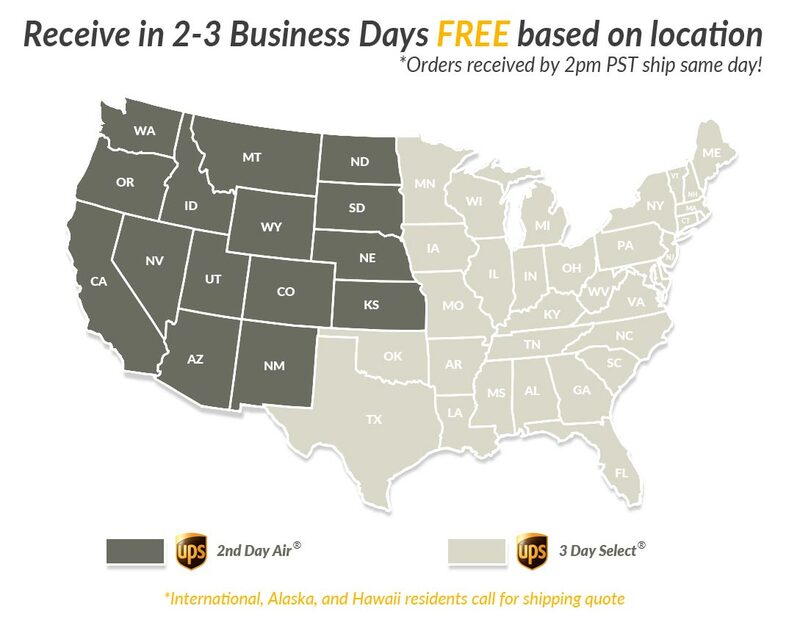 Really fast shipping. Thanks. A quick customer service assisted me on stock and a precisely shipping time. The generator arrived on the promised date and started right up (after adding the oil of course.) I would definitely order from this company again. Delivered in 2 days.Purchased at the time they offered the 1 year extended warrant for free. Filled with oil and gas.Started in 3 pulls.Runs quiet on eco mode.If you need a small generator for lite duty I would highly recommend this one..